I realized today as I was tacking up Drishti that the only thing worse than being afraid of riding would be giving into that fear and being too afraid to ride. It wasn’t that long ago that I was afraid of everything. I feel like over the last few years all I’ve done is face my fears, stand up to them, walk through them. Honestly, I’m kind of tired of it. We went out in the field, I climbed my way up in the saddle, and off we went. My first instinct is to have a good, steady contact on the reins. Part of that is my English riding training where contact is a good thing, but the need to hold onto his mouth – that is fear. Drishti is not a fan of it, but I’m not ripping on his face so he’s taken a quieter, sneakier approach to getting me to let go. The longer we walk the more he stretches his head out. 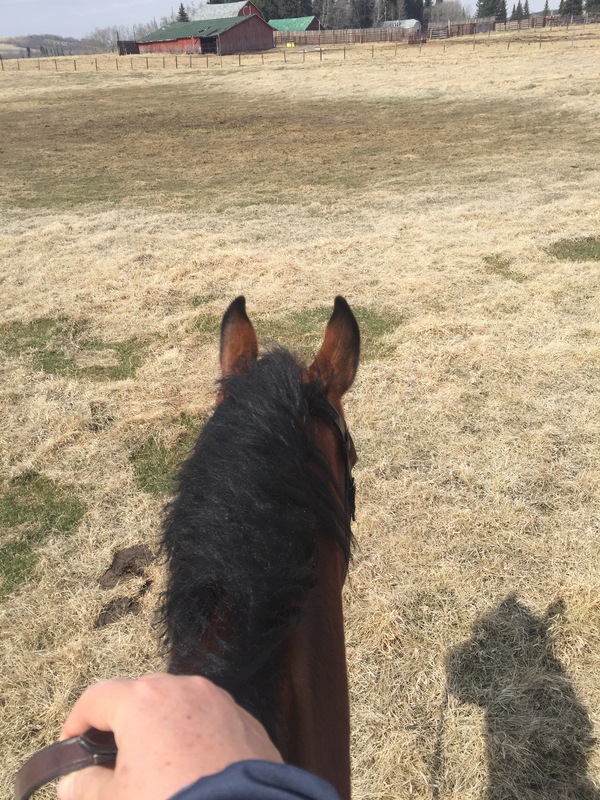 He will stop every once in a while and take big, long looks all around – which could be taken as curiosity, but I’m starting to realize it’s a very effective way for him to get longer reins. I thought about how we are building this new relationship and how it will only work on trust. I know him well enough to know that at a walk he’s not going to buck and bolt on me, so I got to thinking – why aren’t I giving him his head more? I’m not schooling, we are just walking around – why aren’t I giving in. And bam! the reins went to the buckle. And we just chilled and walked around the field – and it was happiness.